Our hall closet was a train wreck and I found the perfect solution to pretty it up. 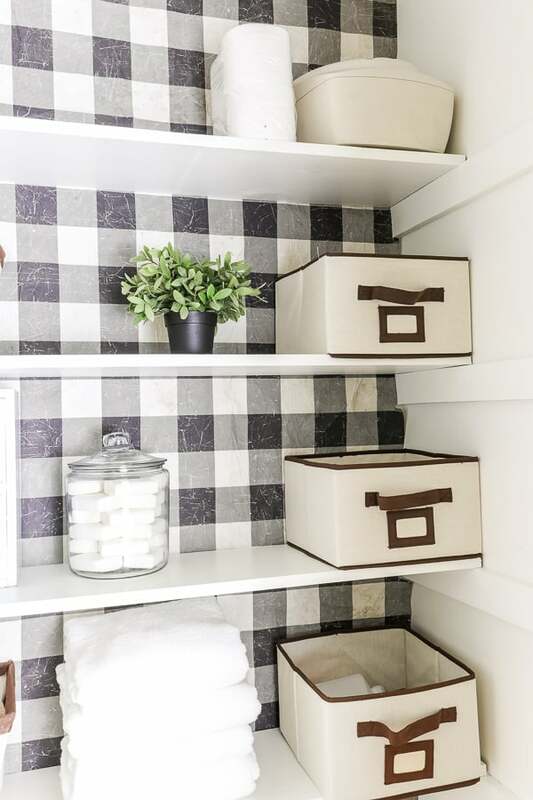 This quick linen closet refresh was just what it needed. I know I’m a bit quirky when it comes to organizing. I’ve shared before that I will stop movies, family time, whatever is happening to get control of a disorganized space. I would sit in my chair to relax at night and it stood there looming. Even though the door was closed, hiding the messy secret – it would get into my mind and under my skin. The result was that I could no longer relax at the end of my day knowing what was lurking behind that door. 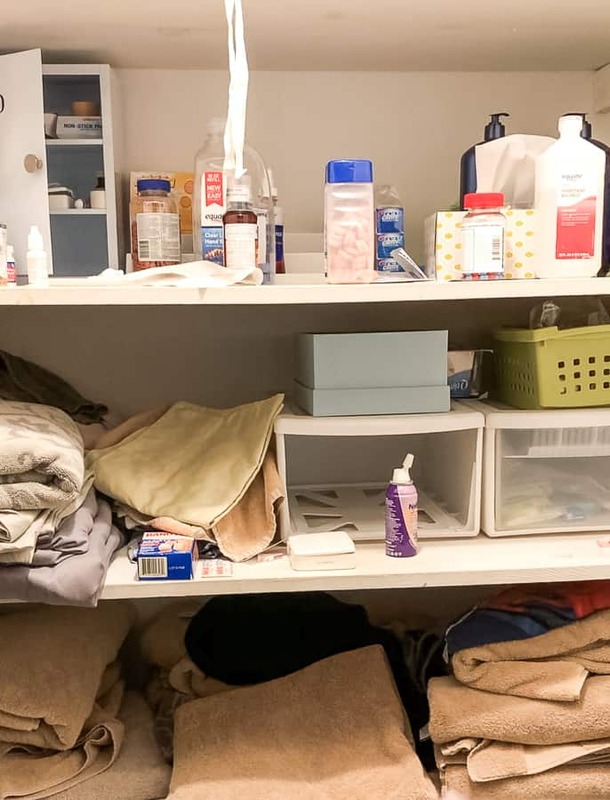 Medicine bottles everywhere, too many towels that we honestly don’t use, and disorganization all over the place. That was the part of the problem, but the main issue was the shelving. 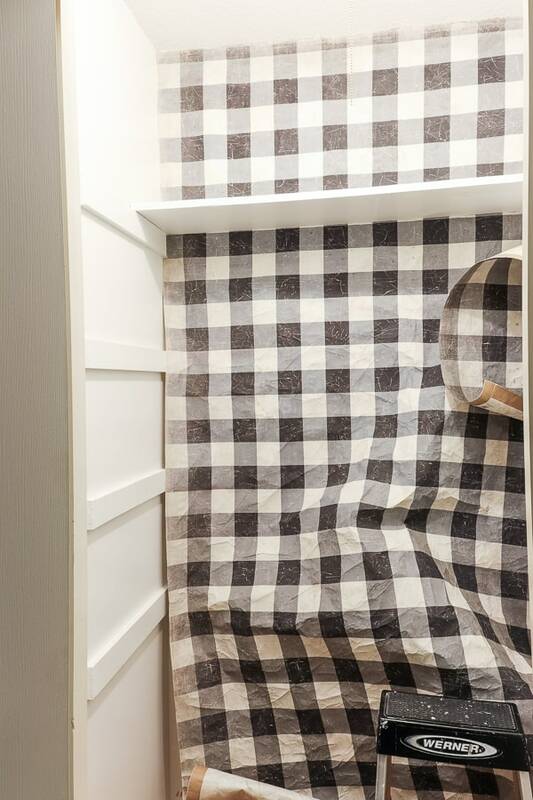 It was too deep and it left the closet difficult to keep straight. 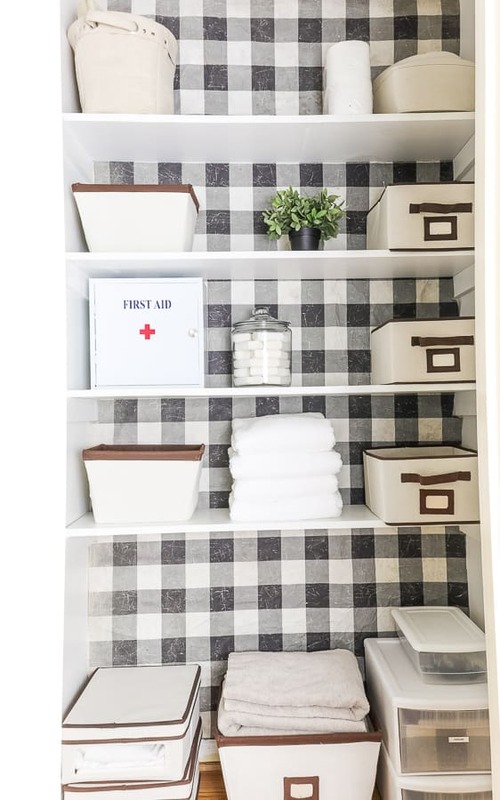 Then I stumbled upon this Buffalo Check Decorator Paper and inspiration struck! 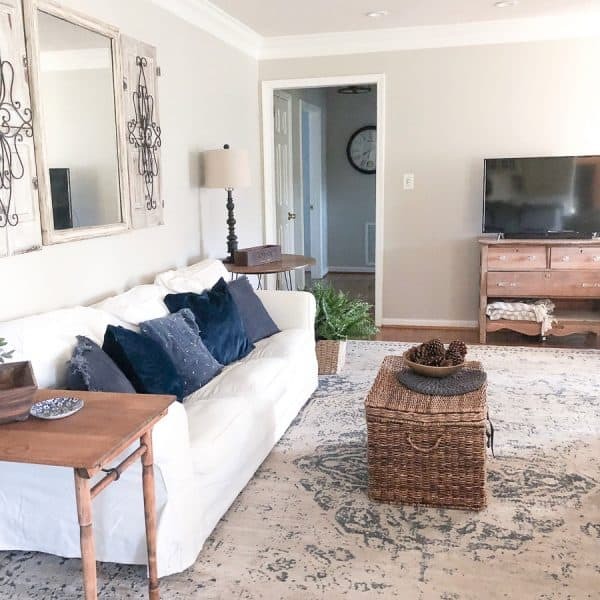 Here’s how we turned the cluttered into a clean space we can all enjoy. 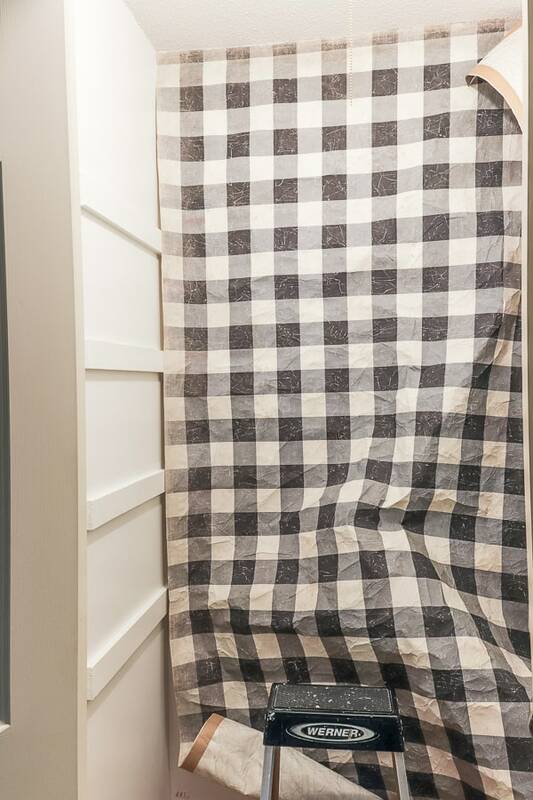 We took an overcrowded hall closet and turned it into something beautiful! Refresh your walls and shelves with a coat of paint. Using the factory cut side as a straight edge, begin hanging the decorator paper starting at the top using command strips for posters. I used 4 for this closet. With the exacto knife, trim the excess from the other edge. Adding shelves will help keep the paper in place as you work your way down. Finish off the bottom with more command strips to hold the paper in place..
Now it was time to organize the items I needed for this space to make it work better for our family. I went through our towels and sheets and found that I could repurpose most of them. 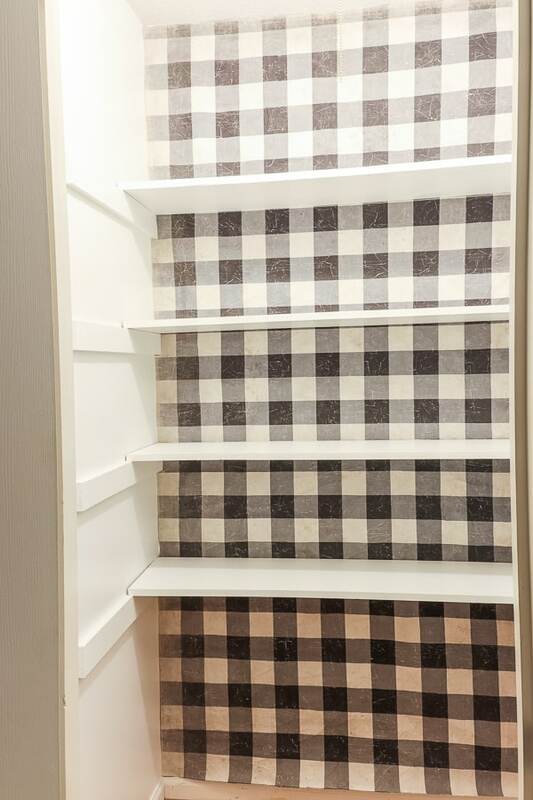 Since this is the closet the boys would use most, I have two sets of towels for each. 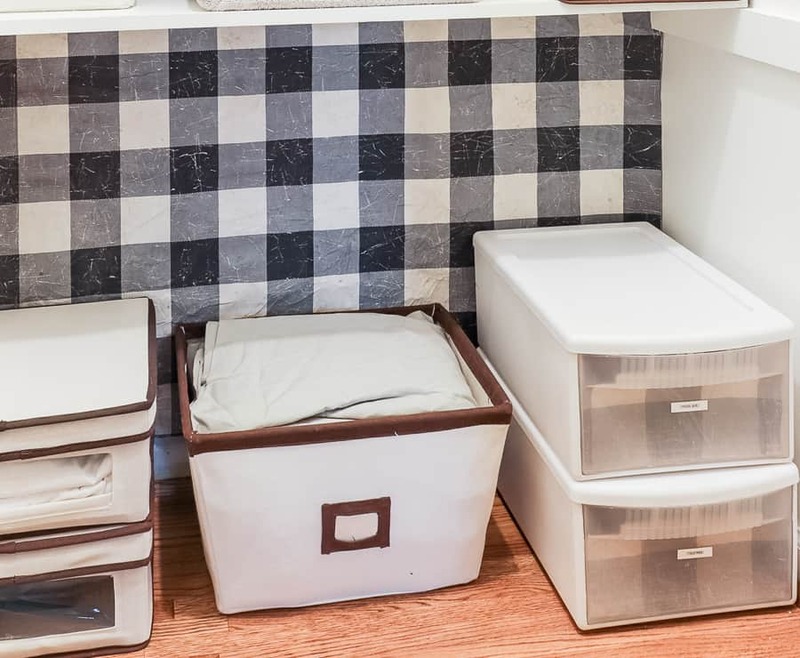 After I renovated our Master Bedroom closet, I was left with fabric closet organizing baskets. 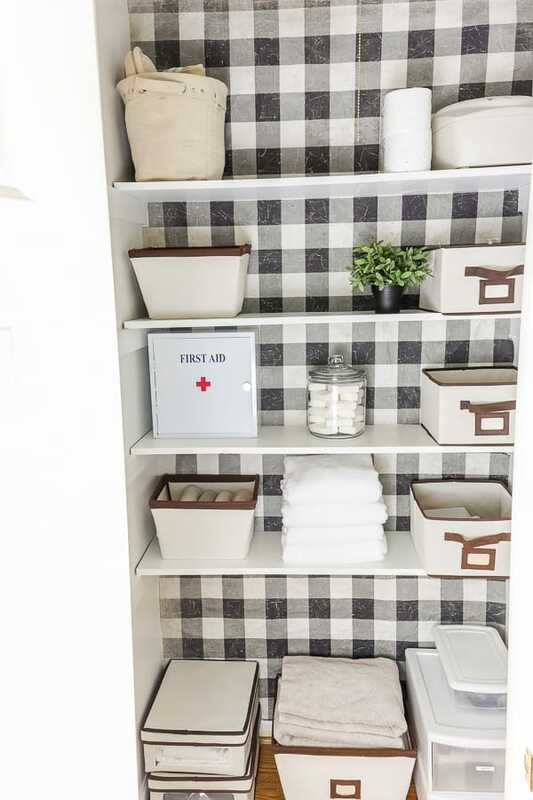 So I repurposed these old closet organizers for this quick linen closet refresh to help keep supplies tidy. This old metal medicine cabinet is a fave of mine. I got it years ago from World Market – but it looks like they don’t carry it online. You can find a similar one here. 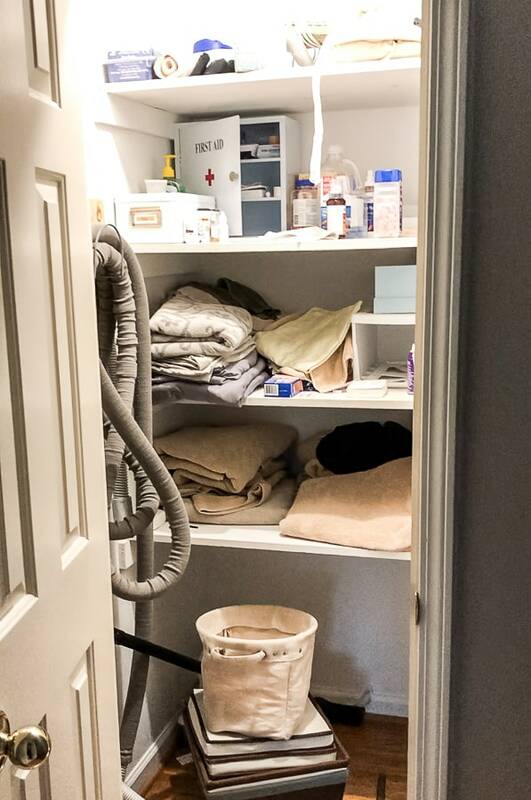 The bottom of the closet is a perfect spot for overflow and sheets. I used the leftover decorator paper to line the fronts of the plastic drawers to keep extra toiletries hidden. And as you can see, there is room to grow! It’s amazing how simply weeding out the unnecessary makes the space so much more open. Now items are easier to find! 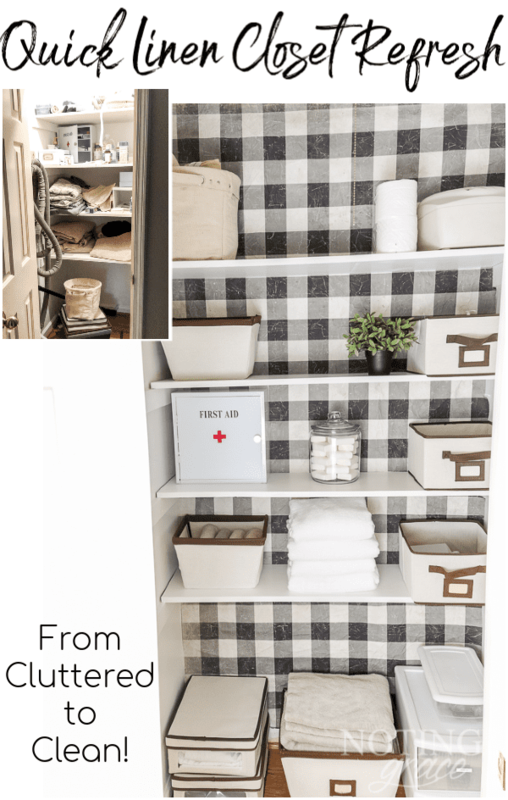 A quick linen closet refresh that only took an afternoon. So by weeding through and getting rid of the unnecessary, now my space is tidy and beautiful! 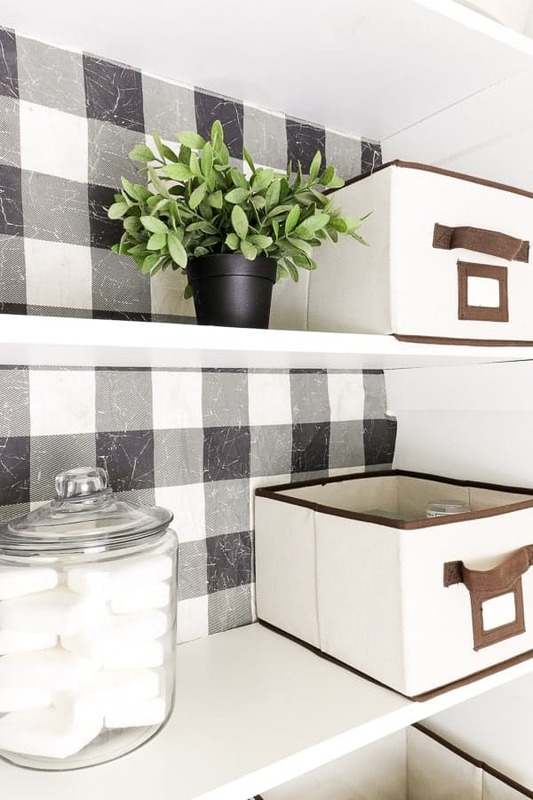 I am swooning over that black & white patter on the back of your linen closet! 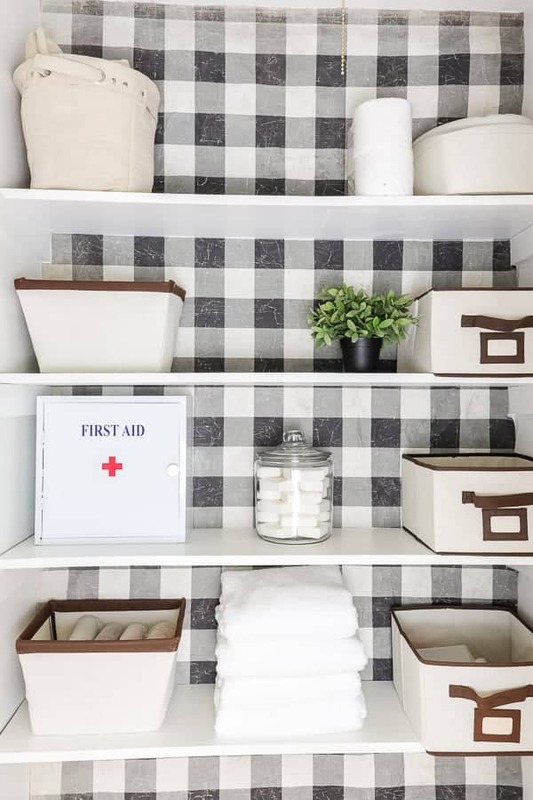 Gender neutral baskets for storage! Creative and clean. . .my kinda’ decor! Thanks Pat! I’m so happy with the updated space! So glad you stopped by! 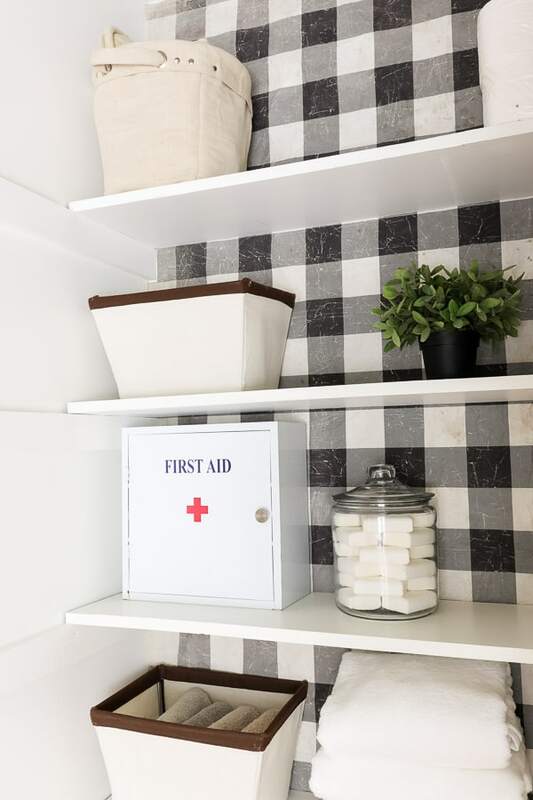 Wait – I am fascinated – you hung the wallpaper with command strips!??! Makes sense that the shelving helps keep everything in place as well. GENIUS!! It’s a decorator paper – sort of like a giant poster for us decor lovers! I am loving the updated look!